During my years supporting Chelsea, I’ve had many favourite players but, with no disrespect intended to any other who has worn the shirt for my club, Frank Lampard is my all-time favourite and, in my opinion at least, the greatest player the club has ever had. I’ve known Frank Lampard since 2001 when he joined Chelsea FC from West Ham Utd. He’s always struck me a really nice guy with no illusions of grandeur although he had every right to hold some. Through Frank, I also met his father Frank and mother Pat and there is no doubt that ‘young’ Frank kept his sense of reality and his feet on the ground because of their influence. His generosity toward the Chelsea supporters has known no bounds and, despite his always busy schedule, whilst at the club, he always tried to find time for those who wanted an autograph, a photo with him or just a few words. His contribution to Chelsea has been immense. He won every honour that the domestic English game could offer and, of course, was team captain on what some describe as Chelsea’s greatest night when, due to the fact that John Terry was suspended, he lifted the European Cup in Munich. That night, I was fortunate enough to have been invited to the celebratory party at the team’s hotel by Frank, one of the best moments I’ve experienced in all the years I’ve supported the club. I told him that and his reply was, “I wish I could take every Chelsea supporter for a drink!” He spoke from the heart and it was something I know he meant. He also captained Chelsea to victory in the Europa League final (this time because john Terry was injured), the winners medals going in his trophy cabinet along with the 3 Premiership/Premier League, 4 FA Cup and 2 League Cup he’d already accumulated. As well as the 106 senior caps he won during his international career during which he scored 29 goals for England, in 2005 he was voted FWA Footballer of the Year and was runner-up in both the FIFA World Player of the Year and the Ballon d’Or. As well as many other individual honours he was awarded during his time at Stamford Bridge, in 2010 he received the FWA Tribute Award. 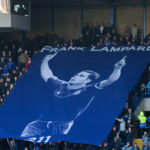 However, as far as the Chelsea supporters are concerned, it was the club honours and the 211 goals he scored whilst playing for the Blues that really count. He played a record 164 times consecutively in top flight matches for Chelsea, a run that came to an end due to a bout of flu with, coincidentally, the first game he missed being the Blues’ visit to the Etihad to play Manchester City. It was little wonder that he was voted Chelsea’s Player of the Year on no less than three occasions. Lampard was a player that always gave 100% when playing for Chelsea and his rapport with those following the club made him a firm favourite. 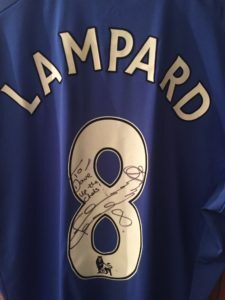 His parents once told me how proud they were when, after one of his first few Chelsea matches at Stamford Bridge, they walked away from the ground and down the Fulham Rd alongside supporters who were singing “Super Frank Lampard”. Although he once said he didn’t want to play for another English side, the circumstances changed. Up until his retirement, Lampard was a professional footballer. It’s what he did for a living. Professionals don’t have a ‘one-club only’ clause like supporters. He’d told me plenty of times that he wanted to end his playing career at Stamford Bridge and, when it became clear that he and the club were poles apart as far as his Stamford Bridge future was concerned and his contract wasn’t renewed, he was broken hearted. It was a great pity for Frank and the Chelsea supporters that both José Mourinho and the club allowed him to leave. Even though he left in 2014, I feel he still could have done a job for the team now although, in truth, if he was still with Chelsea, he would probably be a bit part player. Nevertheless, his influence and experience would have been priceless and assets that current manager Antonio Conte would have used to their fullest extent. He was a role model for many of the young and up-and-coming players at Chelsea, his attitude and work ethic both on the pitch and at the training ground an example to all. Although he’s often spoken about his desire to one day manage Chelsea, in a way, I hope he never realises that ambition. Although a part of me would like to see him become the ‘gaffer’, I’d always fear that any spell in charge would end in the ignominy of him being sacked. It’s a fear that I have expressed to him personally and something I have also said to two other of my Chelsea heroes in John Terry and Joe Cole. However, in losing Lampard, the club let slip a player who was not only a credit to Chelsea Football Club, the England national team but also to football in general. If it were down to me, I’d offer him a job for life at Chelsea, either as a coach or in an ambassadorial role, something he was made for and something in which he’d be simply fantastic. Anyway and to my mind, even leaving the football aside, Frank Lampard is simply just a fantastic human being. Super Frank Lampard – Chelsea’s greatest! Here is a link to Henry Winter’s piece in the Times with excerpts from DJ’s excellent tribute. A paywall applies.